IDX created this special JVC Power Package for the GY-HD100 and GY-HD101 camcorders. The special JVC mounting bracket incorporates a 14.8V to 7.2V regulator to power the 7.2V camcorder from IDX DC camcorder batteries. Furthermore the bracket has 12V DC output connection for lighting and the JVC Hard Disk Drive DR-HD100. An optional accessory mounting kit O-FS100 is used to secure and power the DR-HD100. Power Package for the GY-HD100E and GY-HD101E camcorders. 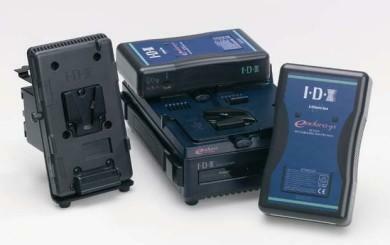 The optional add-on mounting kit O-FS100 secures and powers the DR-HD100E hard disk recorder. (iii) IDX-100-E package components and disk mounting kit O-FS100 are uniquely available from IDX dealers. (ii) O-FS mounting kit is designed as an add-on to A-E2HD100 bracket.